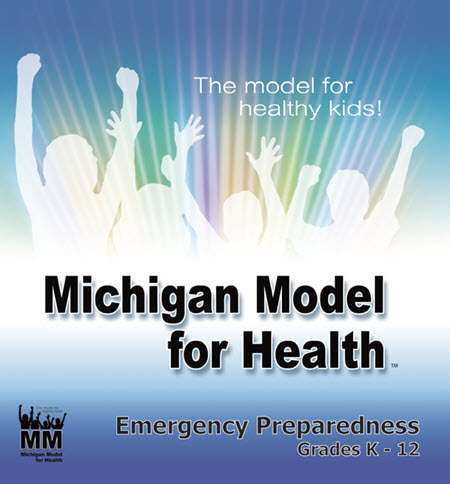 The Emergency Preparedness Curriculum is a comprehensive and sequential set of lesson plans and activities designed to be taught in grades 1 through 12 as a supplement to the Michigan Model for HealthT curriculum. The purpose of these lessons and activities is to provide educators with the tools to teach students how to prevent, protect, respond and recover from natural and manmade disasters. This includes empowering students with the knowledge and skills to make smart decisions before, during and after an incident, and ensure all families have disaster plans. At the elementary level, there are four to six lessons at each grade level that can be taught within a short period of time or spread out over the school year. At the secondary level, there are thirty activities from which middle and high school educators can choose. Each activity is about twenty minutes in length and can be integrated into many different content areas. The Emergency Preparedness Curriculum was recently updated and the entire curriculum is now available on a flash drive. Newly developed instructional materials for the lessons/activities are also available. Contact your Regional School Health Coordinator to obtain your flash drive and instructional materials along with training https://mishca.org/where/.